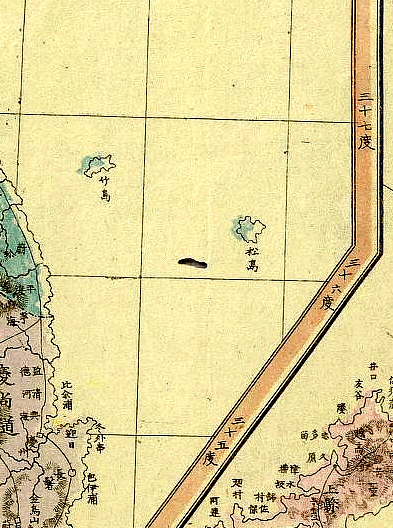 On this page is yet another Japanese historical map that placed Dokdo Island as part of Chosun. Dokdo Island was also known as Matsushima (松島) by Japan and Hornet or Liancourt Rocks by European nations at this time. 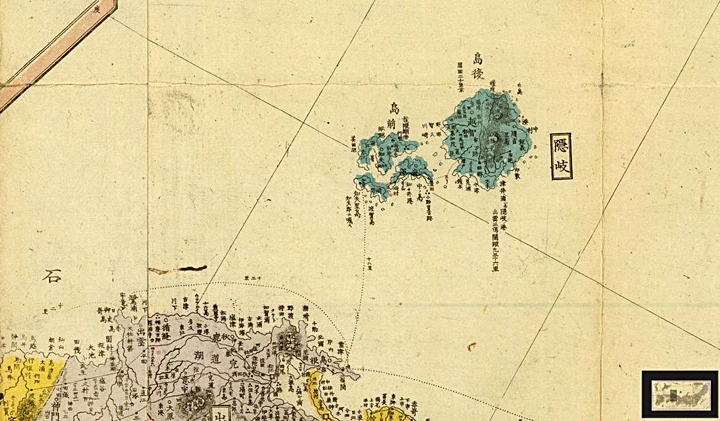 A few Japanese maps showed Dokdo Liancourt Rocks written as (リユンコ-ルトロタク) in Katagana. During the 1870~1880s, the question of ownership of Ulleungdo and Dokdo became clearer. Documents and mapping trends clarifying who owned these islands are more plentiful. This is why so many national maps of Japan excluded Ulleungdo and Dokdo. 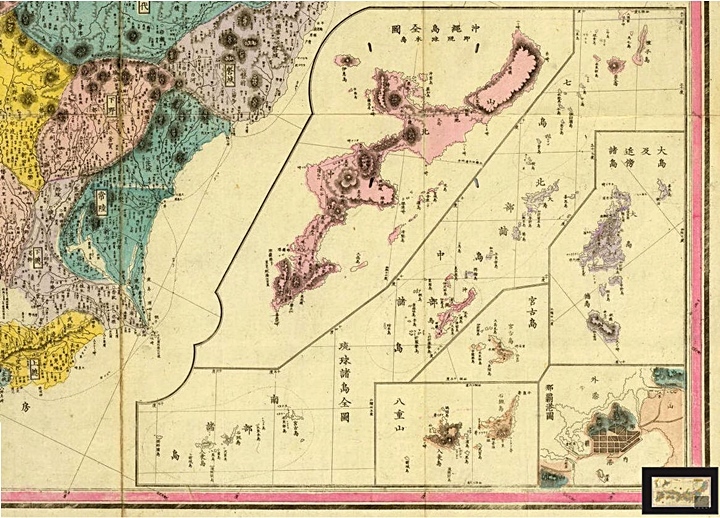 Mori Kinseki’s chart omitted Dokdo (松島) from Japan and included the islets as part of Korea. Viewing the two close-up images below we see two islands included within the appended map of Chosun (Korea) and the same color as Gangwan Province. These islands are of course Ulleungdo (Takeshima 竹島) and Dokdo (Matsushima 松島) It is also worthy to note the appended map of Korea has a border that deliberately separates mainland Japan from Ulleungdo and Dokdo. As with the vast majority of the maps from this era the shape and form of both islands is vaguely drawn. 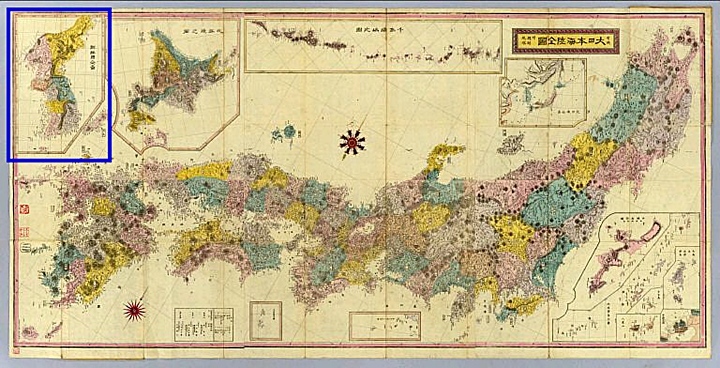 Mori Kinseki’s map also shows the islands to be located in a more westerly location due to Seibold’s 1840 mapping error. Above images: The close-up pictures show Ulleungdo and Dokdo colored the same as Korea’s Gangwan Province and separated from Japan by the Korean map’s border. The map drawn by Mori Kinseki does more than show Dokdo as Korean territory. Because he was careful to include appended maps, we can be sure outlying minor islands and newly “acquired” territories were included and up to date. Upon viewing this chart more carefully we can observe appended maps of Japanese minor islands all along the perimeter. Some of Japan’s minor islands are very small and distant. Above the map of Japan there is a map of the Kurile Islands that extend to the North of Hokkaido. Below there are smaller maps of the Ogaswaras and the Izu Seven Islands group. In the lower right there are maps of the Ryukyu Islands chain with a detailed map of Okinawa. These appended maps tell us Dokdo Island was not one of the minor outlying islands thought to be part of Japan. The scores of historical charts found on this website confirm this without a doubt. 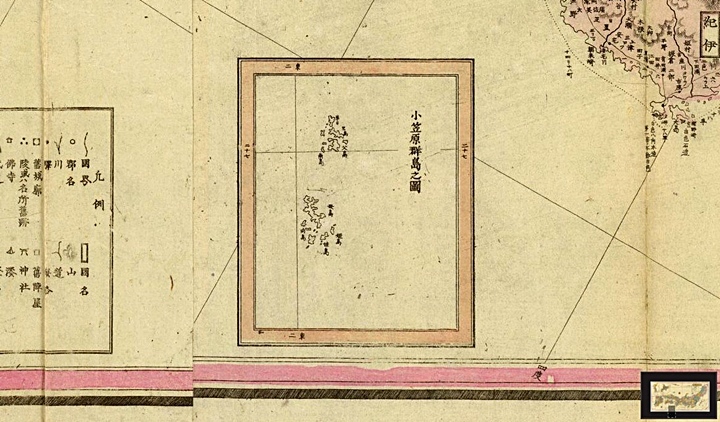 Another interesting attribute of Mori Kinseki’s 1877 map was the inclusion of dotted lines all around Japan’s perimeter. These are ocean voyage routes and many of them have the distances of departure to arrival written on them in Japanese ri (里) (1ri=4kms) Dokdo Island could not have been considered important as the cartographer placed the islets’ location under an appended maps of Japan’s Hokkaido and the Kurile Islands. When we examine Japan’s Oki Islands, (shown right) there is no voyage route that extends beyond this island group in a western direction toward Dokdo and Ulleungdo. The fact that Japan did not openly voyage beyond Oki is yet another point that eliminates the possibility Dokdo was part of Japan in 1877. 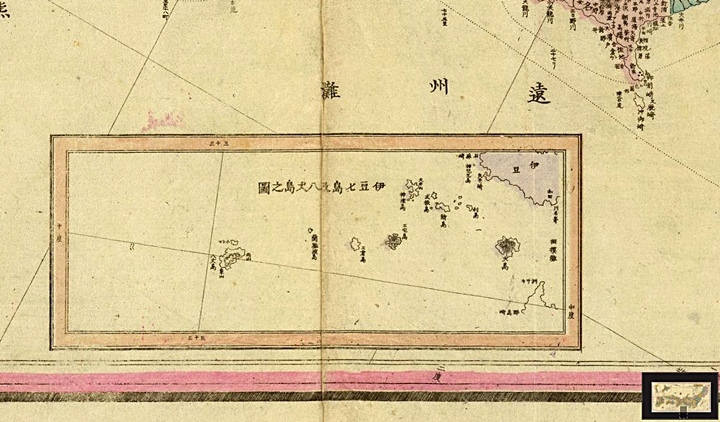 Above right: A closeup of Japan’s Oki Islands from Mori Kinseki’s 1877 map shows no sea voyage routes extending the West. Oki Islands were historically Japan’s western limit. Yet Another Piece of Historical Data That Supports Korea’s Claim to Dokdo – Takeshima. 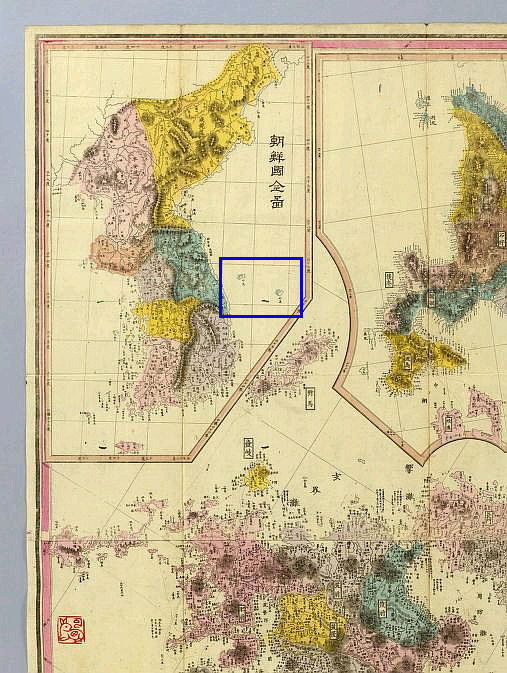 Mori Kinseki’s 1877 chart helps tell us which country had possession over Dokdo Island by what it includes and omits. By inserting the islets within the boundaries of Korea it can be understood Dokdo was part of Korea. Having added many smaller maps that displayed Japan’s distant islands, if Mori Kinseki was under the impression Dokdo was part of Japan surely one of these maps would have incorporated Dokdo-Takeshima but this was not the case. Additionally voyage routes on this map tell us Japanese of the day had no interest in voyaging beyond Japan’s traditional western limits, the Oki Islands group of Shimane Prefecture.